The Liberty Train: "Because I Decide"
A women’s group on the northern coast of Spain devised a plan to fill a train full of protestors against Government proposals to reform the abortion law by destroying a woman’s right to decide. “El Tren de la Libertad” - destination Madrid - was the result. Liz Cooper got on board at Valladolid. Valladolid station has an elegant 19th century façade, modern bustling interior and long, bare, windswept platforms where these days the fast trains from the south pull in regularly, taking just over an hour from Spain’s capital city Madrid. 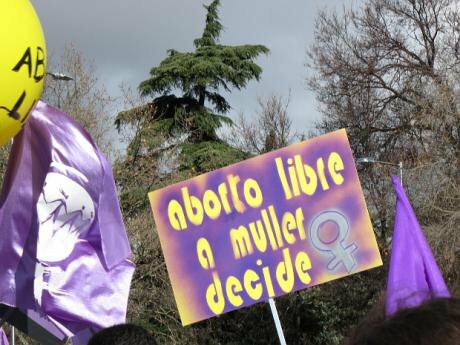 Awaiting the arrival of the train from Asturias in the north, over 4 hours away by rail, is a group of women dressed in lilac and violet smocks, dancing, chanting and whistling behind a huge banner proclaiming “Aborto libre No a la reforma Gallardón” (Free abortion. No to the reform of Gallardón). 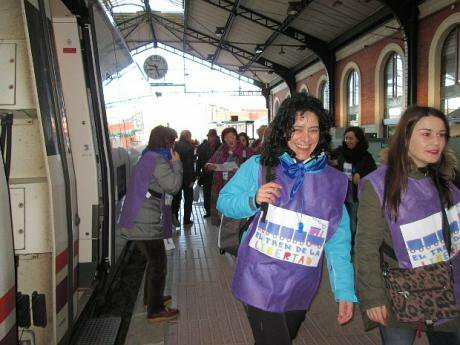 It is a local Valladolid women’s group, who have arrived to receive “The Liberty Train” from the north. This is no normal ordinary scheduled service. The train awaited includes 150 seats booked some months earlier by a women's group Tertulia Feminista les Comadres from Gijón on the northern coast, as part of their initiative to fill the centre of Madrid on Saturday February 1st with a protest against the proposed retrograde abortion law reform of the current conservative Government. A number of women on the train fought in the 1980s for the first law to legalize abortion after the end of the dictatorship. This time around they intend to deliver their message “Porque Yo Decido” (Because I Decide) in seven languages, to the doors of the Spanish Parliament. Mainly organized via Facebook they have received massive support with Liberty trains coming in to Madrid from major towns: Seville, Valencia, Granada, Barcelona, and from all over Spain. Buses also are bringing in protestors; some from the Basque country arrive to join the train in Valladolid. Publicly expressed support has come from the European Parliament, France, Britain, Italy, Argentina and the Ukraine; many other voices have joined the protest. There are symbolic marches planned in London in support, and in Paris 5000 people have marched in protest at the Spanish Government plans. 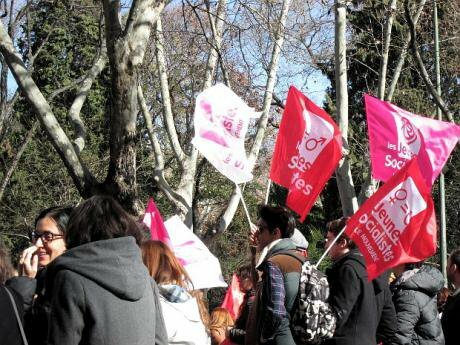 The Gijón women’s group is to spend the Friday night in Valladolid and they take the opportunity to protest at the annual convention of the Partido Popular (PP), the current governing party, coincidentally in Valldolid the same weekend. The Minister for Justice Ruiz Gallardón responds to the women’s protest by saying. “No amount of shouting is going to make me give up my commitment to complete my programme”. He also tells an interviewer that he is very proud to be seen as the creator of the reforms which he has been talking up to the press since 2012. It smacks of a personal obsession. The proposed new reform against which this protest is convened overturns the 2010 law passed by the last Socialist Government which recognised a woman’s right to decide on abortion, giving her the decision up to 14 weeks of her pregnancy without question. The new proposals are in essence an attempt to wipe the idea of a woman’s right to decide off the reproductive map and give legal credence to the moment of conception as the beginning of life thereby equating abortion with assassination. It is pure Vatican dogma. Pressure from the European Parliament has already made the Spanish Government hesitate and consider putting off further plans to push through the law until after the European elections in May. There is a growing international consensus that the proposal is barbaric, even drawing critical comment from the New York Times. Recently the Catholic Episcopal Conference in Spain, whose outgoing President is the Archbishop of Bilbao, Rouco Varela, well known for his anti-abortion and other right wing views and frequently a target for the radical feminist group Femen, has gone further than the Government in proclaiming that any abortion law is wrong. “No one has the right under any circumstances to take the life of an innocent human being. Any abortion law however restrictive remains an unjust law.” So no meddling by a democratic society with the beliefs of the Catholic Church would seem to be the message. It should be remembered that Spain is, according to its Constitution, a non-denominational State. To add to the mix, a new Spanish Cardinal, 84 year old Fernando Sebastian Aguilar, has just been appointed by the recently enthroned “liberal” Pope, and has inaugurated his position as Cardinal by describing homosexuality as a defect that can be corrected by treatment. He has not yet proclaimed on the subject of abortion, but it is thought he is unlikely to have feminist views on the issue. In what century does the Catholic Church, and the right-wing, live? History tells us that in the 20th century in Spain together they supported fascism, the Franco dictatorship, the subsidiary position of women and the Sacred Crusade against communism, republicanism, masonry and homosexuality. It looks as if they may now be taking advantage of an extreme right-wing Government, with a left opposition still in disarray to mount a serious attempt to return to those times. It is clear that amongst the Church leaders there is at the very least an intention to destroy the hard fought rights that Spanish women have won over the last thirty-five years. On Saturday morning the train leaves Valladolid on time, packed to the rooftops mainly with women, on its one hour dash to the capital. There is a women’s film crew on board, national and regional newspaper journalists and photographers, video films in progress, lots of lilac dressed women excitedly pushing past each other up and down the aisles, women practising the song written for the day in an atmosphere of excitement and nervous anticipation; everyone seems to be interviewing someone and all are talking at the same time. The journey is over in a flash. At Chamartin, the northern Madrid station, the women still have one more train to catch, the local train to the southern station Atocha, where the demonstration is assembling on the station’s huge esplanades at the bottom of the Paseo de Prado. The protestors will walk just over one kilometre up to the Spanish Parliament (Las Cortes) past the Ministry of Health and the world famous Prado Art Gallery. Madrid has prepared its own special welcome for the marchers. The “Marea Blanca” (the White Masses) of protestors wearing the habitual white uniform of many health employees, most of whom are women, has for months been out on the streets protesting against the privatization of healthcare in the region. Just one week before the Liberty Trains arrive, the Madrid Government backs down over the privatisation of six major hospitals admitting the health system is practically paralysed. It is the perfect context for the multicoloured marchers to move into with their thousands of banners, flags, drums, tambours, whistles, violins and guitars backing the chanting and animating the slow progress of the marchers. There are trades union groups, many men in support, lots of children, prams, dogs and even a few bicycles but mainly it is a moving mass of women chattering, blowing whistles and chanting slogans with banners held high in the various different languages of Spain. It is cold but the sun is shining. As expected the demonstration is blocked a hundred metres or so away from the Parliament building and cordoned off by police. After maintaining their position for some time, calling for the resignation of the Minister for Justice and the Prime Minister, the Gijón women are allowed to present their written protest at the Parliament building. 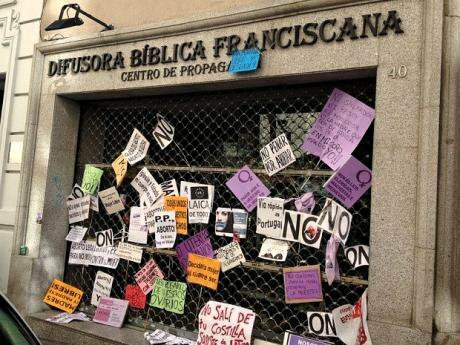 The bulk of the march breaks up as people veer off to the meeting to be held at the Trades Union Headquarters of the Workers Party (CC.OO) dumping their banners as they go, some in the barricaded window of a Catholic Franciscan propaganda shop. Was it worth the enormous effort involved? Numbers were estimated at around 30,000 by the digital newspaper “Público”. For a small independent group of women with very little support from the national media in the run up to the protest, to have inspired women and men from all over Spain, and even from other European countries to catch the train in protest against the intended changes to the current abortion law, is surely a remarkable achievement... But perhaps their even greater triumph is the reiteration of the existence of a feminist movement, once again being openly and proudly proclaimed on the streets of the capital. In the early days of the new Spanish democracy, women’s rights were certainly seen as a crucial part of the future of Spain and many women fought to achieve them. One initiative of the incoming Socialist Government in 1982, and probably with the best of intentions, was to create the Institute for Women at state level; over time many smaller versions were set up at regional and municipal levels. They have done, and still do, much to further the cause of women but suffer from one diabolical defect: they are at the mercy of whatever political party happens to run their government, their autonomous region or their town hall. Currently, as most regions and town halls are in the hands of the conservative PP, they are suffering massive cuts and reduction of their powers. The brief era of pro-feminist legislation of the last Socialist Government is being destroyed and feminism as a political position, as legitimate as socialism or conservatism, seemed to be fading away behind the skirts of the government run Institutes for Women. Thanks in no small part to the Gijón group, who according to the press have achieved the biggest and the most widely supported protest against the reforms to date, feminism is back where it belongs: on the national political agenda. It was obvious on Saturday that the protestors will not give up. They have made it clear that women will make the decisions about their reproductive rights for themselves and are not prepared to let the Church and the right-wing destroy what they have so far achieved. If need be, they say, there will be more Liberty Trains and they will keep coming.